But seriously, my life has been full of activity since last posting. I have learned so many new tricks...and my Mommy falls for them every time! 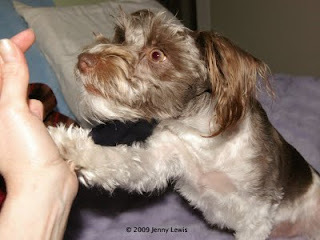 I can do all of the following things on command without fail...sneeze, smack a high five, kiss, whisper (yeah, really! 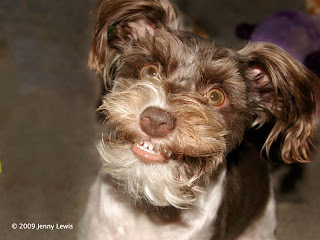 ), sneer my teeth in a fake growl, sit, catch a ball and...wait for it...do single and double twirls while standing on my back legs. I have just begun doing combo tricks, like sneering my teeth while twirling, or sneezing and giving a high five at the same time. Hey, I gotta keep it fresh, right? Here is a shot of me practicing my smack routine with my mom. Don't worry, I promise to be better at sharing all my adventures with you...including...horror of horrors...a bath! !